Dental ultrasonic cleaners are a very effective way to remove all types of debris from dental instruments. These industrial strength ultrasonic cleaners even reach hard to reach crevices where microscopic contaminants might hide. Frequency output for dental ultrasonic cleaners often range between 40 KHz and 60 KHz. Because ultrasonic cleaners only use electricity to clean and do no use harsh chemicals they are eco-friendly. Most dental lab ultrasonic cleaners are constructed from stainless steel. Some offer options such as a built in heater, thermostat, digital timer and even touch screen operation. 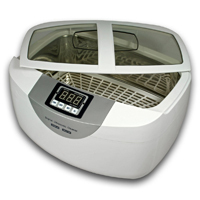 The size can vary between dental ultrasonic cleaners from smaller bench mounted options to large cabinet size cleaners. Regardless of model and vendor chosen, a warranty should be included with purchase. Be sure to research servicing options for your dental ultrasonic cleaner.